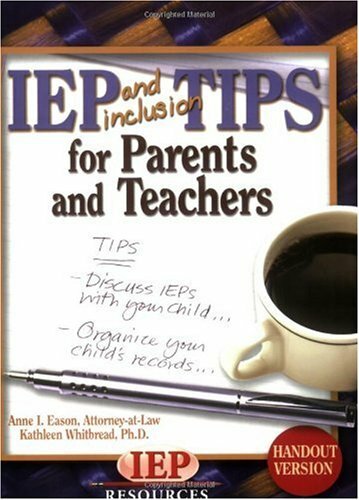 I liked the IEP Tips for Parents and Teachers because it was easy to use and wasn't too wordy. The book addressed topics and issues that were relevant and gave good ways of handling specific scenarios. This book is an easy read and contains lots of practical suggestions. I particularly like the way it is organized, making it easy to refer back to important points when you need them. Prior to a meeting, parents can use the checklists provided to make sure they have all the information they need to be fully prepared. It's an ideal resource for parents whose children are just beginning public school as well as for more experienced parents who are looking for new ideas. As a preschool teacher, I have already added it to my school library.